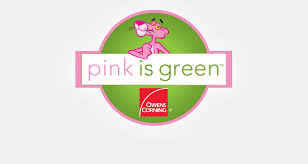 Owens Corning Roofing and Asphalt, LLC is the first roofing manufacturer to establish a program for recycling shingles. We connect contractors with convenient recycling facilities through a national strategic alliance with Earth911.com and Heritage Environmental Services. As part of this groundbreaking program, contractors take the Preferred Contractor Shingle Recycling Pledge, committing to recycle their shingle tear-offs. Currently there are 45 major cities with recycling locations. 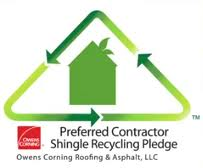 Homeowners can also commit to recycling by taking their version of the Shingle Recycling Pledge and selecting a contractor who recycles shingles from Owens Corning’s Contractor Locator page. Since the program began in 2009, we've recycled 100,000 tons of shingles, the equivalent of approximately 33,000 roofs. Every recycled roof is comparable to recycling more than 100 percent of a year’s worth of household waste. 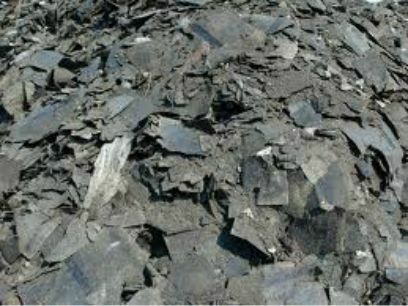 Combined, the recycled shingles provided 100,000 barrels of oil in the form of asphalt for beneficial reuse typically in paving. Each year in the United States, approximately 10 million tons of recyclable shingles are removed from the roofs of homes and buildings. When you choose a roofing contractor who is able to recycle torn-off shingles, you are helping the environment in two ways: Your old shingles don't end up in a landfill, and they get re-purposed as pavement! Go with a contractor as committed to recycling shingles as you are. It's a way to help save the the planet. When you choose a contractor who recycles torn-off shingles, you get reassurance that your old shingles won't end up in a landfill. You can help reduce landfill waste by the ton. According to the United States Environmental Protection Agency (EPA), every year 88 million tons of waste from construction renovation or demolition of buildings is sent to our landfills.This waste includes torn-off shingles. Super-size your recycling. The EPA estimates that every person generates over 4 pounds of waste every day, which means the average household generates 2.2 tons of waste per year. So recycling your roof is like recycling more than 100% of a years worth of your household waste. 20% of the shingles torn-off a roof is made up of valuable petroleum based asphalt. If you filled trucks with all of that asphalt each year, the line of trucks would stretch from Tallahassee, FL, to Indianapolis, IN. All that asphalt could potentially be reused.